When we look back in human history, it’s lined with wars and conflicts between people. As long as not everybody agree, that the overall goal is to take the responsibility to get along, it’s a hard goal to reach. Maybe it is not realistic to believe that we will be able to stay friends, at all times. Heated discussions, debates and conversation, causes development, proximity and relationships that enable us to develop. It is important however to take the responsibility to make sure that nobody feels offended or sad by what we say, because that will cause an imbalance of power, and the conversation that could have lead to development instead risk to become a brawl, a conflict. There are contexts and forms of interaction where there are natural power imbalances. For example, in families, parents are allowed to make more decisions than children. Since they are responsible for their children’s safety, security and development, they sometimes have to stop their children from doing things. Parents are also have a responsibility to look after their children’s right to be children. To enable them to make their own experiences and learn from them is an important part of development. We allow children to make new experiences and take more responsibility as they grow and mature. When adults give children the right to be children, we also have to accept that children need to make a fuss, say no and in other ways train themselves in their pursuit of greater independence. The parental challenges can be many. All parents who have tried to curb their child’s experience or development know that when we say no, the child can make different amounts of resistance. They can hit the doors, call us insulting names, fight or hurt themselves. The low arousal approach call such behaviours, behaviours of concern. Thus, where there are people, there are behaviours of concern. In all families and contexts where there are people, conflicts arise. That’s the way it is. But sometimes conflicts get out of control and we need to understand and solve the problem. Sometimes the causes are obvious and the roots of the conflict are easy to resolve. Sometimes it’s not. It may feel like the altercation came from nowhere. Or it may seem like there are nothing but fights. That’s why we developed the app Behaviour of concern. The app is designed to help parents and care facilities to understand and solve problems. To systematically examine when there are behaviours of concern, is the first step in being able to solve a problem. And that’s where the app can be an aid. Behaviour of concern is an app that helps you get an overview of trouble and behaviours of concern. 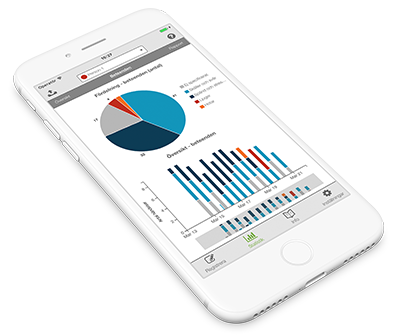 The app is simple to use, the analysis of the behaviors can be trickier. Some people might see clear patterns by themselves and can adapt demands or in other ways make facilitations in order to minimize trouble. Our experience is that sometimes it can be difficult to understand the behaviours of concern. Then you may need professional consultation to understand the variety of functional variations and thus how to deal with the problematic situations. This entry was posted in App, Behaviour of concern, Children. Bookmark the permalink.